We're not going to let this happen. 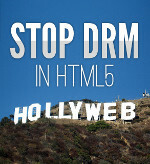 Sign the petition to help us reach 50,000 signers by May 3rd, the International Day Against DRM. On May 3rd, we'll deliver your signatures to the W3C in an eye-catching stunt that's sure to make headlines and make it impossible for the W3C to keep pretending this isn't a big deal. Build momentum: use this page to share the petition far and wide. If you want to learn more about the myths around this issue, the Electronic Frontier Foundation has an excellent write-up which covers all of the misleading discussion around the proposal and how, no matter what platform or browser you use, this puts the Web as we know it at stake. Read it here. You can read and share the online version of this message at http://www.defectivebydesign.org/we-dont-want-the-hollyweb.